Compressed air filters, as well as filters of all kinds, are found everywhere in the world, and most of us are familiar with some of their applications. On this site we are focused on filters for compressed air systems. What they are, how they work, how to size and install filters. If you are the owner of a typical DIY, smaller air compressor, it’s a good bet that your air compressor did not arrive with a compressed air filter as part of its OEM equipment. Cost is the primary reason, I suspect, though it could be argued that for the typical DIY, a compressed air filter on their compressor may not be absolutely necessary. I argue against that, but then, I’ve seen what water borne crud does to valves, cylinders etc. I suspect water from filter-free air compressors gums up a lot of air tools too. For any compressor installation where compressed air is used on a steady basis, compressed air filters are absolutely necessary. Even if you only own a small air compressor, the information that follows will prepare you for securing filter if you need one (using a small air brush compressor for example). For the shop professional, you really do want to read the following if you are not familiar with these important compressed air treatment accessories. A very basic compressed air filter is shown in the image below. I found the quality of this particular filter to be suspect, and it’s my own fault as I purchased it from a low-cost outlet. If you are buying a compressed air filter, don’t do what I did. Buy yours from a reputable source, and to my mind that is a store that focuses on compressed air, or an industrial, compressed air supplier. The proper selection and use of compressed air filters will prevent many short and long term problems with your compressed air equipment and systems and could save you substantially in down-time and component replacement costs over the life of your compressed air system. A standard compressed air filter (cheap ones and good quality ones) will typically contain the following components shown in the image below. The numbers on the picture of the compressed air filter picture correspond to the description farther along in the text. In North America the filter ports have been traditionally female NPT threads, although lately it could be a metric thread into which the air line fitting is connected. Air flows through the inlet. The cap is plumbed internally to force the air to flow downwards and spiral into the filter bowl. This creates a cyclonic action in the compressed air stream to throw free water and debris that may be in the air stream against the walls of the bowl, where it will flow down into the bottom. The filter cap may be composite plastic or of metal construction depending on the manufacturer. Satisfactory compressed air filter operation depends on the air flowing through the filter cap in the correct direction from the supply line out the filter discharge. The correct air flow direction will usually be identified on the cap of the compressed air filter, by an arrow. The arrow points in the desired direction of air flow from the supply line to the filter discharge. The air filter will not work properly if you inadvertently reverse the air flow by installing the filter backwards. The dotted line depicts the flight path of the compressed air as flows toward the filter discharge. In order to exit the filter through this path, the compressed air must have undergone the cyclonic action phase, and then passed through the filter element, further purifying the airstream. This is the filter discharge allowing the flow of the filtered compressed air from the air filter and down the air line to your applications. The fitting size of the discharge port will usually be the same as the inlet port. Some compressed air filter manufacturers offer adapters to allow you to change the port and fitting size to one that best suits your application. In order to reduce inventory of spare parts, some companies will keep a standard 3/8″ NPT filter as their base unit, and add adapters to the inlet / outlet ports to fit them to the smaller NPT sizes. While it is feasible to use a larger filter unit on the small air line, attempting the reverse may impede compressed air flow. Do not do this unless you have checked to ensure that the flow of the smaller air filter has sufficient capacity for your application. This will be a choke point if you under size the air filter. This is the filter element. Insufficient air supply problems encountered downstream from your compressed air filter are often caused by the element becoming plugged and choking your air supply. If your air tool or applications isn’t getting enough air, check the element. Clean it or replace it, depending on the type. Some manufacturers offer a Delta P gauge as part of their filter assembly. The Delta P will indicate pressure drop across the filter, and by extension – the filter element . Increasing pressure drop on the gauge indicates that the filter element is doing its job, it is trapping debris and removing it from the compressed air stream, and getting plugged up in the process. The dirtier your air, the sooner your filter elements will plug. Filter elements have a specific flow capacity measured in CFM (cubic feet per minute), and a particulate size rating measured in Microns. 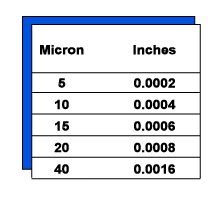 The chart below tells you the actual size particle that a specific Micron rating represents. General purpose filter elements are 30 or 40 Micron sized. For some applications, you might need a finer filtration, and opt for a 5 Micron element. Depending on your air quality, a 5 Micron particulate size element might clog too quickly. Use a general purpose filter upstream from the filter with the 5 Micron element, to increase the finer element filtering capacity. So too, when your air filtration requirements dictate a move into even finer air filter elements such as a coalescing filter type. You will definitely want to have a general purpose filter first, then a 5 Micron filter unit to further rid the air of particulates before the air stream reaches the extremely fine coalescing filter element. We have been talking about the parts of the compressed air filter. The items numbered in the filter drawing farther along are described in the text beside that number. 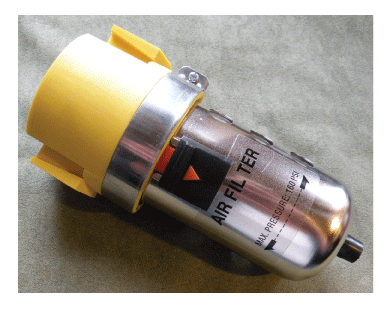 The filter bowl of your air filter may thread into the cap housing, or it may be connected to the cap via bayonet-like mount. Installing the filter bowl with the bayonet style of mount requires pushing the filter bowl up against the cap, rotating it a short distance, and letting the lugs on the bowl slide down into the receptacles in the cap. To remove the bowl, you reverse the process, but first making very sure that there is no air pressure in the line or in the bowl. Remember, force equals pressure times area. Sometimes the bowls of the air filter are plastic with a metal shroud, or are completely metal construction. That being the case, why use metal or metal shrouded bowls filter bowls? There’s a page about that on this site. Inside of almost every air filter bowl there will be a device that separates the bowl, horizontally, into two sections. This barrier, often made of a plastic or plastic composite, is usually installed hanging from the bottom of the filter element inside the bowl. It has the purpose of blocking the cyclonic incoming air and preventing that fast moving compressed air from reaching the puddle of debris, water and oil that the filter is collecting in the bottom of the filter bowl. 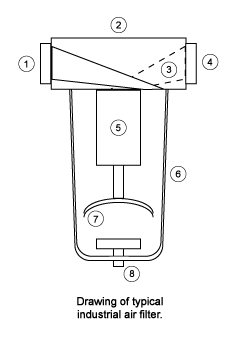 The barrier creates a quiet zone in the filter bowl, allowing the contamination that collects onto the sides of the bowl to flow down, out of the cyclonic air stream, and to remain – without getting entrained or re-entrained back into the same air stream, until the waste liquid can be expelled from the drain at the bottom of the bowl. All industrial compressed air filters will have a drain of some sort in the bottom of the filter bowl. These drains may be manual, a float type, or can be electronic auto drains. They need to be opened regularly to allow collected water and debris to escape from the filter bowl. Failure to drain the filter bowls often enough will mean that the water and debris in the quiet zone will fill past the barrier, and once there, be entrained into the cyclonic air stream, onto, and sometimes even through the filter element. In some cases debris and water from a full filter bowl will flood the element so badly that it seems to become almost no filter at all, and is actually contributing a steady stream of crud downstream, to damage the air components, and choking your air supply to death. What size of compressed air filter will you need? There is a page of information about compressed air filter sizes on this site. Here are the generally accepted symbols for drawing compressed air filters in your circuit schematic. I bought a used compressor that I want to use for some painting and also run air tools.